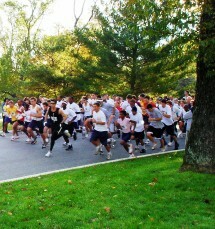 The proceeds from the memorial run go toward the Renie Amoss Fund, which grants monetary awards each school year to Goucher College students who have established an exceptional academic record while participating in more than one aspect of co-curricular student life on campus. Race proceeds, fundraising events, and generous donations have brought the trust fund total to more than $350,000. Investment returns have been used to fund annual awards to over 62 Goucher students. Donations to the Corene E. Amoss Memorial Scholarship Fund are very welcome. You can make a formal donation to the fund as outlined below. However, our family often suggests to friends and family to register and pay the entry fee even if you can not make the race date. This is a great way to keep the event thriving and to make a small contribution.